We all need to know how to barbeque chicken whether on a grill on in barbeque smokers. These bbq recipes are the favorite camping and summer recipes. Because uncooked chicken is very perishable keep it cold in an ice packed cooler until ready to place on the grill. Also important is to have on hand soap and water or some way of disinfecting all equipment which the chicken touches. This is one of the foods which needs careful attention to cleanliness for health reasons. To cook chicken on a dual burner gas grill, I heat the grill then turn off one of the burners. Place a drip pan on the unheated side with a little water in it. Lay the chicken over the drip pan. Reduce the heat to medium, close the lid and cook for about 1 hour or until the chicken is thoroughly cooked and tender. 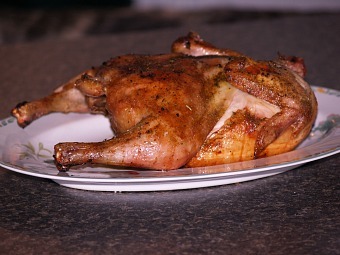 Learn how to barbeque chicken also over charcoal for great flavor. I use indirect heat also on the charcoal grill. Depending how much chicken you are cooking and the thickness of it (or whole chickens), start with about 50 briquettes of charcoal. After lighting the charcoal and they have reached that gray stage, with long handled tongs, move the coals around a drip pan centered in the middle; about 25 coals on each side. Add ½ inch of water in the pan and place chicken over the drip pan. Cover with grill lid and cook until chicken is thoroughly done and tender. If learning how to barbeque chicken, this indirect way of cooking is great for grilling whole chicken and other grilling recipes. Prepare the grill the same way using the drip pan. Heat grill to medium high making sure heat is evenly distributed. While the grill is heating, season or prepare the chicken as your recipe instructs. Place the chicken breast side up on the grill rack directly over the drip pan. Cover with the grill lid and cook 1 to 1 ½ hours or until the chicken is fork tender and done throughout. NOTE: When learning how to barbeque chicken, it is important to know what the temperatures of the coals are. Here is a simple test. After the coals have turned to the gray ash appearance and you have the coals arranged for your cooking, carefully hold the palm of your hand over them at cooking height. Count the number of seconds that you can hold your hand there before the heat forces you to pull your hand back. Two seconds means the coals are hot 400F degrees to 450F degrees; four seconds means the coals are medium heat 350F degrees to 375F degrees, five seconds means the coals are low heat about 300F degrees to 325F degrees. Prepare coals to medium high heat. Remove neck and giblets from the chicken; rinse chicken with cold water and pat dry. Sprinkle cavity of chicken with salt. Place lemon and parsley inside cavity of chicken. Fasten neck skin to back with skewers and turn wings back and tuck tips under shoulder joints. Rub outside of chicken with oil and sprinkle with paprika. 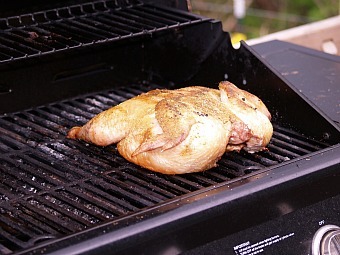 Place chicken on grill over the drip pan; cover with grill lid and cook about 1 to 1 ½ hours or until tender. When I first learned how to barbeque chicken, I wanted to try grilled lemon chicken recipe; I love the flavor. Another blend of herbs and spices I use is: 1 tablespoon salt, 1 teaspoon paprika, 2 teaspoons onion powder, 2 teaspoons crushed sweet basil, ½ teaspoon thyme and ½ teaspoon garlic powder. Combine lemon juice, minced onion, lemon peel, salt, tarragon, paprika and pepper sauce for marinade. Arrange chicken pieces in glass dish in one layer; pour marinade over chicken. Cover dish with plastic wrap and refrigerate for several hours. Lightly oil grill rack and place chicken over medium hot coals. Cook chicken 15 to 20 minutes on each side basting often with marinade until chicken is thoroughly cooked and fork tender. Place chicken skin side up on rack over hot coals. Combine juice, soy sauce and salad oil; brush chicken with sauce. Cook chicken over coals about 60 to 90 minutes or until tender brushing with marinade frequently.